Yorktown’s primary goal is to provide all students a first-rate academic education while fostering the development of the whole child. This commitment is reflected in Yorktown’s unique social and emotional education (SEL) program, known as Yorktown ROCS – Respect Others, Your Community, and most of all, Yourself!. Yorktown has been recognized for this program as a “National School of Character” by the Character Education Partnership and with the Claudia Dodson Sportsmanship, Ethics and Integrity Award. The Washington Post ranks Yorktown as one of the most academically challenging high schools in the metro area and over 90 percent of Yorktown’s graduates go on to post-secondary education. Yorktown’s AP Scholars program, which provides college level course work aligned with the National Advance Placement (AP) Program, offers students the chance to develop their unique personal interests and talents with the support of a mentor. Yorktown received the Siemens Foundation Award for Advanced Placement participation and achievement, one of 50 schools nationally to win this award. 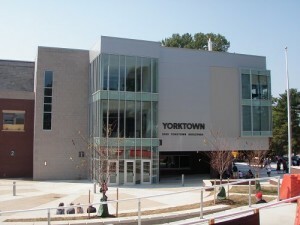 Yorktown addresses the needs of each student through a broad curriculum and several individual programs and support networks such as team-taught world history and English courses in ninth grade which fosters a smooth transition from middle school to high school, a writing support center, a math lab, and after school academic supports. Yorktown’s “Center for Leadership and Public Service” coordinates various student programs in leadership, service and social-emotional learning. A cornerstone of Yorktown’s whole-child focus is Senior Experience, which originated in the county at Yorktown to provide seniors the opportunity to explore possible career paths through real-life, hands-on learning. The high level of student involvement in all of Yorktown’s programs and the recognition students receive for their accomplishments are the direct outcomes of their talents and of the dedication of the staff—both of which are hallmarks of the Yorktown Patriot experience.